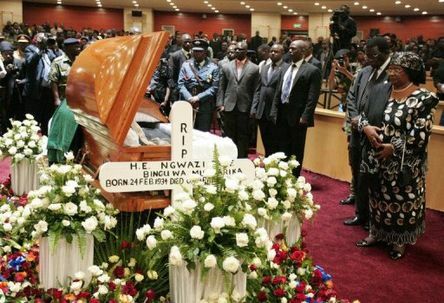 Throngs of people from all walks of life visited the National Assembly Building in Lilongwe to pay their last respect to the late president of Malawi, Professor Bingu wa Mutharika, whose body lay in state. The former president was loved and loathed by many, especially for his economic policies and public speeches. For the past two years, he almost always called for Dr Ntaba, the presidential spokesperson, to interpret or soften his addresses for the lot of Malawians. Though Mutharika who had been dubbed as Mose wa lero – modern-day version of the Biblical Moses who had taken the Jews out of slavery in Egypt, for getting Malawians from a hunger stricken country that relied on food aid to a food surplus country, had started losing touch with reality, his viewing attracted longer queues than the ones Malawians had started getting used to at fuel pumps and sugar depots towards the end of his rule. Another dramatic irony was that most people who had come to pay last respect to this fallen hero, also branched to the nearby Kamuzu Mausoleum, where Ngwazi Hastings Kamuzu Banda, the father and founder of the Malawi nation, was buried. The first Ngwazi had broken “the stupid federation of Rhodesia and Nyasaland (now Malawi) and really built Malawi from scratch. However, he had become unpopular for his dictatorship rule towards the end of his three-decade regime, which was characterised by fear of arbitrary arrests of all his critics and sudden disappearances. In a dramatic similarity, the Ngwazi Professor Bingu wa Mutharika who saved Malawians from hunger with his fertiliser-subsidy programme and had modeled himself on the ‘original’ Ngwazi, started losing popularity for assenting bad laws and the arbitrary arrests of critics, which was a clear violation of freedom of expression. “He was a good leader, only that maybe he had modeled himself too much on the first Ngwazi. He that forgot times have changed and that Malawi is a democratic state now. But he will be missed,” said Hope Phiri, one of the mourners who had come to pay his last respect to the former president. Bingu’s body was being viewed in the state-of-the-art parliament building that his government constructed with help from the Chinese government, it lies adjacent to the first ever five-star hotel in Malawi.